One of the foremost concerns in the mind of policymakers, pundits, and academics in recent years is the prospects for liberal reforms in developing nations that have experienced social revolutions. To some extent, the pace of reforms put into operation frames their domestic and international identity and builds political capital. The capacity to legislate liberalizing reforms could appease any potential opposition as well as the skeptics of the regime. It might also quiet down more moderate members of the revolutionary ruling coalition who have identified with wide-ranging revolutionary goals and undo the corruption and illegitimacy associated with the deposed regime, for those not prepared to concede other more radical positions to fellow coalition members. Reforms can also keep the spirit of the revolution alive among younger generations over time. For those who did not experience the ill-conceived policies and structural conditions that gave way to the revolutionary transition, reforms have a conversion effect. The more reformed minded the regime, the more the younger generations will show allegiance to revolutionary policies, mobilization strategies, and rhetoric. Drawing inferences from a comparative study of three Communist regimes in the developing world, this paper questions the prospects for reforms in one party states. First, if there are so many domestic and international incentives to undertake reforms, why do revolutionary elites fail to embrace more market and political liberalization? Second, what conditions lead to more reformist policies in some post-revolutionary societies as compared to others? And, third, why do Caesarian revolutionaries like Castro, Mao, Ho Chi Minh, or more recently those governing Iran and North Korea, concentrate on stalling rather than promoting liberal reforms? To formulate a proposition to these questions, I propose to compare recent Cuban policy initiatives with reforms undertaken in Vietnam and China.3 These countries have experimented with different versions of market socialism since the 1980s. The three societies share similar experiences related to their condition as developing nations that underwent revolutionary transformations to rid themselves of illegitimate autocratic governments. Moreover, the three have toyed with their own ideological brand of Marxism-Leninism. Notwithstanding different epochs and distinct political cultures, these three nations have all formulated policies designed to re-insert themselves in the world economy amidst their nationalist political culture. Yet despite these congruencies, each has instituted different paths and degrees of liberalizing reforms. The evidence I examined suggests that with respect to economic, social, and even political spheres, China is ahead of Vietnam and Cuba, the least reformist of the pack, in terms of the number of reforms instituted. Why are the two Asian autocracies ahead of Cuba? One motivation for researching reform changes among these developing nations is that in many ways, each of their recent development paths defies logic. Smaller dependent market economies, like Cuba and Vietnam, should embrace more rapid rates and meaningful reforms from the outset to compensate for limited market size and restricted demand. A country like Cuba, whose political culture was not touched by Confucianism and underwent a short but nonetheless competitive democratic experience not long before the revolution, should be in the forefront of political openness. Ideologically, the Chinese seem to have been far more successful articulating their brand of Marxism. They also experienced a much longer period of isolation and self-reliance. Yet they have moved further ahead in terms of instituting market based socialist policies. This paradoxical situation invites further research. This paper is part of a larger project that discerns postrevolutionary societies in the developing world and their capacity to reform. The next steps will be to test my conclusions by expanding the number of cases. While my method was inspired by Skocpol’s (1979, 1984) analysis of social revolutions, it departs from this version of the comparative historical analysis in terms of the number of cases and time dimensions— while her research spanned across centuries, mine encompasses decades. My approach also follows Ragin’s (1987, especially pp. 19–30) work on “conjunctural causation.” In this paper, however, I shall argue that specific causal patterns from various contexts—i.e., the dynamics of liberal vs. conservative coalitions— usually lead to different rates of policy reforms despite the fact that the path to reforms in post-revolutionary societies in the developing world is fairly consistent, incrementally moving from cosmetic to more meaningful changes. Nonetheless, a comparative case study of Cuba, China and Vietnam reveals several reasons for why the revolutionary generations do not give way to reforms easily besides the organic generational progression assumed in Ortega’s work. First, revolutionary leaders have tremendous personal stake on the implementation of revolutionary policies. Second, these leaders usually see reality in terms of a furious battle between themselves and their adversaries. Third, any lingering legitimacy after the institutionalization of the revolutionary process is rooted in an inflated nationalistic rhetoric which is anti-reformist in tone and substance. Finally, revolutionary leaders often adopt a messianic operational code concerning their own role in managing the state. A study of the pace of reforms in Cuba, China and Vietnam supports the axiom that the longer autocratic revolutionary leaders and their ruling coalition are away from holding power, the more dramatic an opening the country will experience. 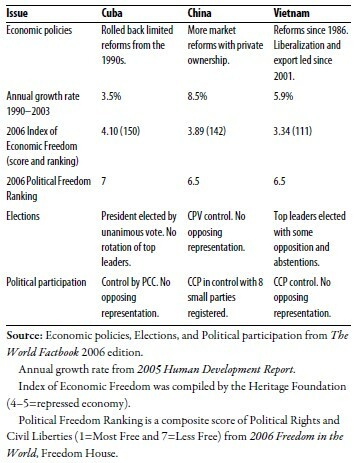 This factor alone seems to explain why the fourth wave of reforms in China, which began in 1992, were implemented sixteen years after Mao’s death and why it took eleven years after Ho Chi Minh’s death for the Sixth Party Congress in Vietnam to pass the initial wave of Doi Moi, but twenty seven years to witness the deepening of this policy strategy. In Cuba, however, the lingering control by the Castro brothers has made the prospects for substantial policy reforms all but uncertain. This discouraging conclusion has far reaching implications for domestic and international actors, the political economy of national development, and adversaries of these regimes whose ambition is to steer the path of reforms. It suggests some support for a prudent policy, rather than containment or destabilization, for state transformations among post-revolutionary societies. Before I proceed to elaborate the reasoning behind my conclusion, I shall discuss how the term reform is utilized in the paper and then I will review some prominent positions associated with the literature on policy formulation and dictatorial politics. The fact that autocratic single party regimes like Cuba, Vietnam and China do not easily embark on liberalizing reforms when autocratic revolutionary elites continue to hold the reigns of power does not mean that the character and policy initiatives of these regimes remain unaltered over the years. In fact, if one examines the legislative history of these regimes it is quite copious. In this paper, I refer to these unsustainable and cosmetic legislative swings as policy adjustments.5 In the case of China, one can simply compare the first phase of reforms from 1978 to 1984 with those that followed. In Cuba, the government position regarding reforms has been less than consistent often shifting back and forth between short periods of relative openness only to resort back to hard line rectification campaigns shortly after. The government of Hanoi, on the other hand, did not deviate much from Ho Chi Minh’s political economic doctrines of state control and self-reliance, which served as guiding principles for policies during the aftermath of the revolution until 1986. Even then, it took a new cadre of Vietnamese leaders to spearhead further economic changes aimed at decentralizing the economy and gradually instituting moderate market reforms starting in 1988. It is usually the case that revolutionary leaders shift policies and the appointments of apparatchiks in an effort to portray a public façade for reformed minded changes and keep the state bureaucracy under control. In the end, state adjustments have the intended effects: to reassert political allegiance for autocratic dictators rather than creating opportunities for change. Moreover, unsustainable policy adjustments usually follow lofty revolutionary ideals that are executed according to the discretion of autocratic revolutionary leaders. This environment of intimidation and political cronyism is not conducive to bold liberalizing reforms. On the contrary, they seem to back the steadfast convictions of regimes to continue with a narrow authoritarian policy course of action. Nowhere is the intransigence of this cadre of revolutionary leaders more evident than in today’s Iran. Iranian President, Mahmoud Ahmadinejad, a member of one of the revolutionary student groups who helped deposed the Shah in 1979, has spearheaded a domestic campaign of repression against dissidents while realigning himself ideologically with the most conservative factions of the Islamic Republic. Abroad, Mr. Ahmadinejad has followed a more confrontational foreign policy than any of his predecessors, insisting on Iran’s right to enrich uranium at home.7 Iran is also building an internationalist foreign policy much like previous revolutionary regimes before it. For instance, in a recent report in the International Herald Tribune, Tehran was said to be collaborating with the Lebanese Shiite group Hezbollah to fill the power vacuum in Lebanon left behind by Syrian withdrawal.8 In the case of Vietnam, hard liners such as Tón Dúc Tháng and Nguyên Hûu Tho could also be considered as intransigent. Among social scientists, the controversy around the prospects for reforms in post-revolutionary regimes has not subsided since the outbreak of the Chinese revolution. One popular argument, especially among instrumentalist observers of Communist regimes, is that revolutionary leaders betrayed moderate supporters by radicalizing the revolutionary process after they firmly control the reigns of power. This behavior insinuates that many who support armed insurgencies in developing nations do so because they believe in lofty goals and proclamations articulated by revolutionary leaders with regards to nationalism and development. Proponents of this position argue that revolutionary leaders hide their true radical sentiments to secure wide broad backing and accumulate stocks of political capital. Once in power, these leaders simply uncover policies they privately held all along. Hence, the tendency or disinclination from the part of revolutionary leaders towards substantial policy reforms once in power is a reflection of hidden ideological interests. One of the major shortcomings of this interpretation is that it overemphasizes subjective intentions that are very difficult to support with verifiable evidence. There are plentiful reasons for revolutionary leaders not to show their more benign side publicly when they are trying to gather widespread support for their fighting. Yet, who is to say there are not other possible reasons for these leaders’ radicalization besides a calculated strategy of deception? For instance, it is possible that during the insurgency process, revolutionary leaders become radicalized as they confront indiscriminative state repression, and they count their closest allies and collaborators among their fatalities. When revolutionary leaders forgo opportunities to support reforms, another argument discerns that it is because these leaders are responding to deep-seated crises or unanticipated conditions. Revolutionary leaders, after assuming power, get to realize the extent of the social deterioration and economic mismanagement that prevails their country. More importantly, by underlying unsupported arguments about intentions, proponents of the various betrayal perspectives often underemphasize how conditions create opportunities that shape state policy and actions. Another interpretation is rooted in the nature of inter- group rivalries. As this reasoning goes, former allies of the incumbent regime often mobilize in neighboring countries to organize transnational advocacy groups with the sole purpose of escalating any disaccording incidents into potential adversarial crises in order to destabilize or curtail revolutionary legislative initiatives and policies. When this occurs, revolutionaries and their adversaries face a downward spiral of relations which lead the former to adopt a more autocratic position to safeguard their own legitimacy at home and qualm the expectations of domestic political supporters. Orthodoxy promotes international provocations that escalate to confrontation. Following this group interactionist position, orthodoxy is the natural end from a series of uncontrollable tactical moves. The behavioralist argument contradicts the group interaction position. If the former was too voluntaristic, the latter is more deterministic. Interactionists undermine any assertion that attempts to demonstrate the inter-subjective capacity of decision-makers to resolve differences and find common interests. In addition, they put too much weight on the actions of disenfranchised groups and their ability to mobilize international public opinion against revolutionary leaders. Finally, it seems that the possibility of any discord between revolutionaries and their external adversaries is conditioned by the structural configuration of the world politics—where it is assumed that anarchy prevents adversaries from building collaborative trusting relations. As many international relations scholars, Kenneth Waltz (2000) among them, have pointed out, during periods of tensions in a bipolar world, radical changes caused more of a stir among allies and former allies than under any other structural conditions. Hence to make the general assertion that revolutionary leaders are “pushed” by outsiders to adopt authoritarian convictions could be a mistake unless one takes into account the effects of the specific structural configurations in the international environment. Even international structural conditions alone should be considered with caution in any attempt to explain the domestic policy swings. In many cases, the structuralist argument forecasts overly optimistic predictions about the level of commitment and durability of new policy predicaments. In fact, as the cases of Vietnam and China clearly indicate, the leader of either nation did not perceive the end of the Cold War as an immediate opportunity for reforms, as they jumped started state liberalization policies well before the end of this period. In the case of Cuba, on the other hand, international events do not seem to affect the course of policy reforms one way or another. Social scientists have been more persuasive when they interpret policy hard line or a propensity to reform by reverting to the nexus between internal regime dynamics and structural conditions. For example, in a meticulous study of how intellectuals depict Chinese and Vietnamese reforms, Alexander Woodside (1998) illustrates how despite sharing a Mandarin vision, intellectuals in these two nations do not study each other’s reforms, resulting in a different pace of development. In the case of Cuba, reference to Fidel and his inner circle’s inclination for gamesmanship has also been noted as another consideration why this group turned to Marxism-Leninism to legitimize their control over the state and the direction of the revolutionary process. Proponents of the elite position I support in this paper often cite such factors as the style and substance of political leadership, the personal stake of leaders, the elite’s perception of deepening economic crises and their consequences, any shared common experiences, or the ideological clouds periling over social ills in developing nations to explain the hard line often subscribed to by autocratic revolutionaries. In this section, I discuss some development indicators to document the extent of reforms in Cuba, China and Vietnam, with emphasis on the first. My purpose is to illustrate the recent political economic unfolding in these three countries and to compare their development performance. This discussion is relevant because as I argue at the conclusion of the section, development performance indicators help us explain, at least partially, how a country like Cuba that has only undertaken tentative policy adjustments at best, has been able to endure without knuckling under the recent wave of market and political liberalization. The data in Table 1 supports the assertion I put forth earlier that revolutionary single party states tend to embark on political and economic reforms when considerable time has passed after the demise of the revolutionary leadership. China and Vietnam are further along the path of liberalization than Cuba. Also the revolutionary leadership is further away from the reigns of power in these two nations. Later in the paper I will offer some tentative conclusions that support this anomaly. For now, I will limit my discussion to comparing the extent of reforms in these nations. Table 1 also shows that China and Vietnam continue to incrementally affirm their own interpretations of a socialist-oriented market political economy. As China became the world’s third largest trading nation in 2005, the country completed another leadership transition, trimmed its average tariff rates by half, and changed its FDI (foreign direct investment) regime to open the retail and distribution sector to foreign owned companies while other direct investments are still subjected to state control. The Chinese government recently loosened restrictions to permit foreign insurers and banks to operate throughout the country. By all accounts, Cuba seems to be moving in the opposite direction. While the first two nominally Communist nations experiment with their own brand of market economy socialism, Havana is centralizing and regulating its economy, in effect rolling back the meager adjustments it implemented to generate employment during the Período Especial in the 1990s. This trend was recently authenticated by Carmelo Mesa- Lago (2005), among others, in one of his annual overviews of the Cuban economy where he concluded that, “Castro launched a process of recentralization of decision making in 2004–2005 that has reversed most advances made by the modest market oriented reforms implemented in 1993–1996” (p. 13). Some of the noteworthy policy measures Mesa-Lago identifies as being more centralized since 2005 include: (1) banning state enterprise from conducting transactions and from providing some services in hard currency; (2) tightening controls on currency deposits and transactions by foreign owned businesses and join ventures; (3) imposing tight controls on all tourist personnel; (4) a value added tax on currency imports; (5) a ban on the dollar transaction and new exchange fees on currency conversions; and (6) halting permits for about 40 self-employment activities. This quick overview of the recent political and economic developments in these nations provides evidence to support my contention that the reforms in China and Vietnam, despite the disputable policy depth, are further along than those in Cuba. This is not to say that the former are free nations or are ideal states to emulate. In fact, both Amnesty International and Human Rights Watch continue to list China and Vietnam among the world’s most repressive regimes— Cuba also appears prominently in the list.14 The point is that the distance between newly elected leaders and the revolutionary leadership in the two Asian nations seems to give way to a more comprehensive process of reforms, however meager, than in Cuba. This trend is likely to continue at least into the near future. Given the regional support they now enjoy from newly elected left of center governments throughout Latin America, especially in the case of Venezuela, who is willing to subsidize the Cuban economy with very favorable energy trade arrangements, the revolutionary leadership in Havana is unlikely to reverse the ongoing recentralization process. When one compares the data from Table 1 and Table 2, a logical question is how does Cuba fare so much better in terms of social safety net indicators than both China and Vietnam? Considering this question is relevant to this paper because, discounting demographics, it is evident that Cuba defends its social gains publicly to legitimize its lack of desire for structural reforms. The Cuban regime often frames these health and educational gains in terms of unparalleled achievements by the revolution, as something no other nation can emulate, or as benefits the Cuban people could easily lose if the course of the revolution is derailed, overturned, or halted. For example, in a May 11, 2006 front page article on the online version of Granma International, the official representative of the Party announced that Cuba has the largest number of children receiving electronic hearing implants in the world and reminded its readers that this is an unprecedented revolutionary achievement. The same newspaper in its April 7, 2006 edition flatly declared that before the revolution, “poliomyelitis was the cause of quite a few deaths, and paralyzed an average of 300 children per year. Cuba was the first country in the Americas to eradicate polio in 1962.” Therefore, the publicizing of Cuba’s health policies can also be seen as an attempt to build political capital to support the conventional position espoused by ruling revolutionary leaders. Table 3 summarizes the progression of political coalitions and market reforms in the three post-revolutionary states I compare in this paper. As the table illustrates, two conditions are needed for postrevolutionary states among developing nations to alter their patterns of development policies and embrace market liberalization. The first is that the autocratic revolutionary leader and his closest associates must have cleared the way for a new generation of leaders to initiate pragmatic policies that would reverse the dismal economic performance of these command economies. The second socio-political condition is that a new generation of reformists needs to coalesce together in support of reforms. Thus far, I have argued that the social distance between the new generation of leaders and the experience of the revolutionary insurgency seems to explain, at least partially, the predisposition for reforms among leaders in China and Vietnam as opposed to Cuba. In this final section of the paper, I present five plausible reasons in support of this assertion. First, evidence gathered from case studies reveals a striking conclusion. Revolutionary leaders cannot resist the impulse to publicly carve a personal affinity between their role as leaders and the revolutionary process. The social origins of these aberrations are very complex. On the one hand, the mysticism surrounding the identity of these leaders as saviors who rescued the nation from the excesses of previous regimes is often a necessary condition to rally support to consolidate the revolutionary process. Revolutions are highly contested political processes and it is often the case that the charismatic authority of revolutionary leaders serves as a rallying point to mobilize popular support for radical measures. Second, one of the most frequent communication tactics crafted by revolutionary leaders to mobilize and control is to frame policy along confrontational views—“us against them.” This perspective has multiple functions to consolidate autocratic authority. It reduces the complex reality of political alternatives to an unambiguous choice between supporters and detractors, imposing limited political options on the population and cutting down alternative oppositional discourses. In addition, since the common enemy is usually depicted as an outsider, the implicit connotation is that only the actions of the revolution are legitimate. 18 Furthermore, revolutionary leaders veil their confrontational view in nationalistic rhetoric and tactics. This is one of the reasons why Mao, Minh and Castro toyed around with self-reliance development strategies while they held power. Fourth, notwithstanding the effects of political rhetoric, another basis for the autocracy of revolutionary leaders is the idiosyncrasies of their own operational code. Social psychologists note that the code comprises the vision, values and norms that sustain political action (George 1969). In the case of revolutionary leaders like Mao and Castro, they view the modernization of the nation as a constant struggle to perfect socialism. They assume that the revolution can manage to modernize society and has the capacity to perform this function more just and effectively than any other capitalist development path. For this reason, Castro justifies his recurrent “rectification campaigns” in the name of combating corruption and other ills he perceives embedded in liberal reforms and follows a Rosseauian reasoning favoring the purity of the revolution against the threat of extraneous forces. Mao also justified his cultural revolution in much of the same terms. The findings from research conducted by Erin Ennis (2002), empirically supports Ortega y Gasset’s assertion that the operational code of authoritarian leaders moderates as the social distance between the cliques of revolutionaries and new generations of authoritarian leaders who succeed them widen; hence, the tendency to attempt to foster modernity with liberal market reforms by current Chinese and Vietnamese leaders but less so by Cubans. If the findings derived from my observations of the Cuba, China, and Vietnam post revolutionary developments are correct, the best hope for political and market reforms after revolutions among developing nations will come after a leadership change precipitates the demise of the revolutionary leadership. When a new generation of leaders who did not experience the tragic contention leading to revolutions comes into the political scene, new opportunities for reforms arise. This is the case because the anti-extremist generation has less vested in the personal experiences and tolling social meanings associated with any struggle for change. With social distance comes a more rational consideration for political and economic choices and alternatives. This conclusion has profound implications for the policy-making community. Policy makers should consider inducing reforms from revolutionary leaders through complex negotiations even if these relations yield minor but significant outcomes over time. The negotiations may not work immediately, but they will build confidence and engage reluctant, highly ideological leaders in some form of reciprocity. Frank negotiations also have positive demonstration effects for future up and coming leaders. Pressures, containment, and embargos have not worked with revolutionary leaders in Hanoi, Beijing, or Havana. On the contrary, they dared revolutionaries to continue to hide their own intransigence behind confrontational perceptions of reality. In sum, the most effective strategy in these situations seems to be serenity and fortitude. 1. 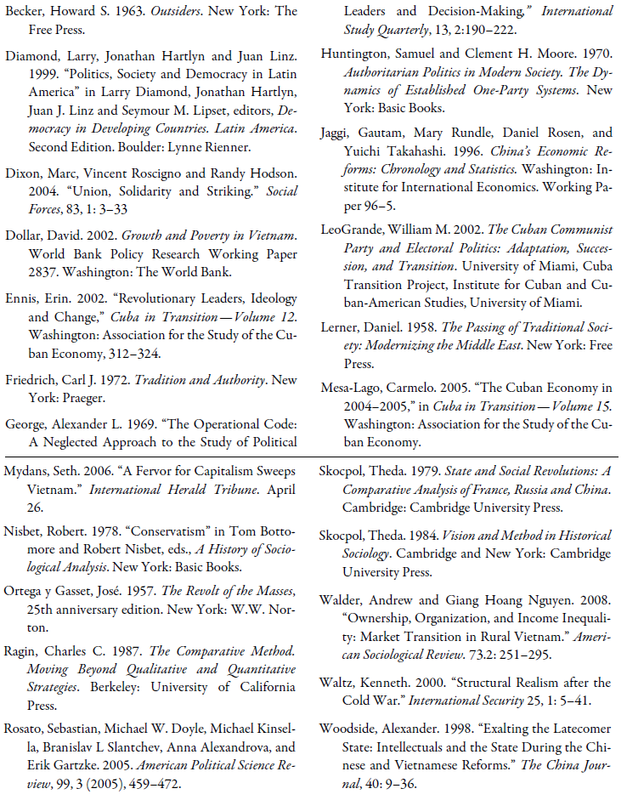 Earlier versions of this paper were presented at the 103rd Annual Meeting of the American Sociological Association, August 1–4, 2008, Boston; The Research Circle Colloquium, sponsored by the Department of Sociology, at William Paterson University of New Jersey; and the “Cuba: In Transition? Pathways to Renewal, Long-Term Development and Global Reintegration Conference,” sponsored by The Bildner Center for Western Hemisphere Studies, the Graduate Center, City University of New York, March 30–31, 2006. I would like to acknowledge the comments and suggestions from Maboud Ansari, Gabe Wang, Jorge Sanguinetty, and, especially, Erin Ennis, a former graduate student who researched many of these issues under my supervision, none of whom bear any responsibility for my arguments. 2. For a critical discussion on the idea of democratic peace, see the exchange between Sebastian Rosato, Michael W. Doyle, Michael Kinsella, Branislav L Slantchev, Anna Alexandrova, and Erik Gartzke (2005). 3. In March 2006, the Cuban daily Granma reported in its online edition that the Department of Economics at the University of Uruguay was hosting a symposium on economic reforms and development in Cuba and Vietnam. The conference was attended by Alfonso Casanova, Vice Minister of Economic and Planning, and Rogelio Martínez, Vice Minister of Finance, on the Cuban side and by Nguyen Ngoc Dien, the Vietnamese Ambassador to Argentina, Le Anh Son, Vice President of the Development Strategy Institute in Hanoi, and Thia Dian Tun Director General of the Department of Commerce and Services in the Ministry of Planning and Investment. The high level delegations on both sides attending this meeting may indicate that there is some interest in Cuba to at least study the Vietnamese model of reforms. See Granma, March 20, 2006. 4. For a classic exposition of this argument see Lerner (1958). 5. In the original version of this paper, I called unstructured policy changes “cosmetic reforms.” I thank Jorge Sanguinetty for pointing out to me the advantages for using the term adjustment. 6. For the significance of dense solidarity in social action, see Dixon, Roscigno and Hodson (2004). 7. “In Iran, a split developing over country hard-line stance,” International Herald Tribune, on-line edition, March 15, 2006. 8. “Iran moves into Lebanon vacuum,” International Herald Tribune, on-line edition, March 13, 2006. 11. For a recent overview of electoral politics in Cuba, see William M. LeoGrande (2002). 12. Just few days ago, four youngsters were arrested and later intimidated by security forces simply because they were thought to be responsible for displaying an anti-governmental sign in a public park in the city of Bayamo. Cubanet, online, May 15, 2006. 13. In another example of the degree of freedom between these countries, The New York Times reported about China’s order to remove some avant-garde paintings from galleries during the Dashanzi International Art Festival, but stated that collectors and gallery owners expressed surprise about the government actions and said they did not expect a broader crackdown. See, “China Orders Galleries to Remove Art,” The New York Times, May 13, 2006, B16. 14. In the case of Cuba, the 2006 Human Rights Watch country report summarizes the current state for freedom in the island in the following terms: “Cuba remains a Latin American anomaly: an undemocratic government that represses nearly all forms of political dissent. President Fidel Castro, now in his forty-seventh year in power, shows no willingness to consider even minor reforms. Instead, his government continues to enforce political conformity using criminal prosecutions, long- and short-term detentions, mob harassment, police warnings, surveillance, house arrests, travel restrictions, and politically motivated dismissals from employment. The end result is that Cubans are systematically denied basic rights to free expression, association, assembly, privacy, movement, and due process of law.” Human Rights Watch, online edition, 2004. 15. Keen observer Dollar (2002:15) has concluded “in terms of regulatory framework for business and government effectiveness in providing services, Vietnam also lags significantly behind China and India.” He concludes, moreover, that the tentative pace of reforms in Vietnam accounts for the persistence of poverty despite the implementation of liberal reforms. 16. Asian Political News, April 23, 2001. 18. For a discussion on how outsiders are framed to legitimize the status quo, see Becker (1963).